I applied to the WordAds program in January, 2015 with 471(!) monthly views. Clearly, WordAds did not accept my blog right away. So I had to wait. As I am a somewhat lazy blogger, my views did not rise sharply. However, they kept on increasing on a slow, but steady pace. I had some ups and downs until finally in October 2017 I hit the magic barrier: 15000 views per month. Some month earlier, I read some comments on the existence of blogs that were in the program and had allegedly 10000 views or less. So when reaching 15000 pageviews and still no news from WordAds I got impatient. I finally found the motivation to write WordAds directly. I got an immediate standardized message saying that they have received my mail. After sending the mail I was expecting a standardized reply forwarding me to the there FAQs. 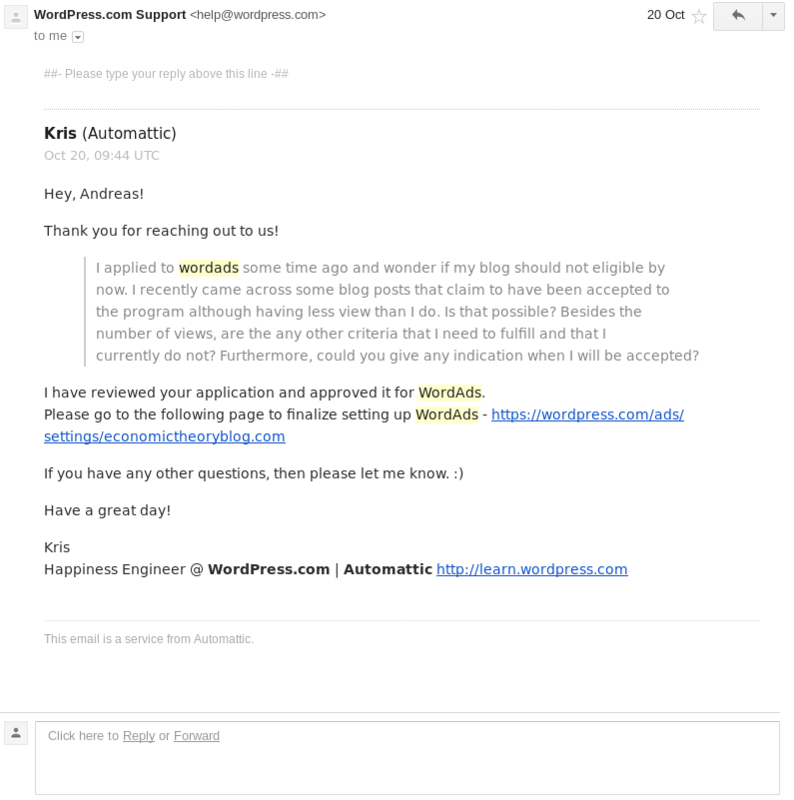 To my amazement, Kris, a happiness engineer @ wordpress, wrote back to me within a couple of hours. And Kris lived up to his job description, I got a positive answer. My blog was approved to the WordAds program with little over 15000 pageviews a month. We can conclude that the minimum requirement to be accepted at the WordAds program is still around 15000 pageviews per month, maybe even less. To conclude, one thing I noticed when searching the web for hints and reports on the minimum traffic requirement, various bloggers got accepted to WordAds after having wrote them an email. I do not know if there is a causality behind this pattern or if sending an email just triggers the responsible person at WordAds to review your application in more timely fashion. Nevertheless, if you feel you might be in the range of being accepted, it certainly does not hurt to write an email. In case you are interested, here is my one year review of WordAds. Great post and congrats!! Unfortunately, I’m only at 5,000 views a month, might be a few more months before I hit the magical 15k mark! Hi, Ad. Im new on wordpress and Im just browsing the WordAds. Is that possible to apply WordAds with free plan blog? because in the WordPress’s “Monetize Your Site” article, WordPress said that I can use free plan blog to apply WordAds (https://en.support.wordpress.com/monetize-your-site/) but WordAds faq site said that I need to have a custom domain name which is can only obtained by using personal or premium plan. Hi Troy. Of course you can apply for Wordads with a standard free plan. However, it is true that you need to have a custom domain name. You can either use your own (if you already have a domain name) or you can get one through wordpress.com. In either case, you will have to pay something for your domain name. Go to your wordpress menu and search for “Domains”. It is there where you can setup you domain name. Okay, thank you, Ad. Btw Im sorry for my bad english. Congrats on hitting 15k and thank you for writing this! It will be a while before I can justifiably bother them to approve me, but it’s nice to at least have a ballpark goal for wordads. Thank you! Good luck with you blog! this is great tip friend…. Thank you! Hope it will work for you! Thanks this great article. I am waiting for nearly two months. Currently my blog only have about 3-4000 pageviews a month. How can have any right way to my application to be accepted sooner? Hi! Unfortunately, I do know. 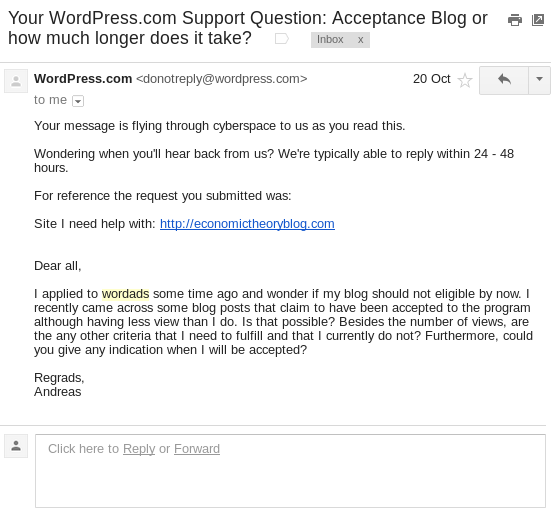 My understanding is that WordAds does not approve blogs with less 15000 pageviews a month. However, ask them directly, maybe they agree on accepting you already now. Finally, once you already have 3-4000 pageviews a month you might be closer to 15000 than you think. Just keep posting. Good luck. Thanks for sharing the tip. My blog generates around 17k – 20k views monthly. I just applied for wordads though I am already monetizing my blog using mainly sponsored posts and native ads but can we ever get enough revenue. Yet to hit $1k/month revenue. Hoping to meet up this target soon. Wish me luck with wordads. Reblogged this on INDIA NEWS. Hmmm! I must confess this is wonderful, thanks for sharing this information with us. Am glad to be here.